Slip-and-falls occur at stores, malls, and businesses everywhere, leading to injuries that require medical care, lost work, hospitalization, or even surgery. 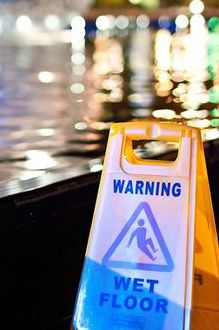 These kinds of accidents can be prevented by attentive employees taking the initiative to clean up a hazardous area or alert the proper personnel, but negligence is all too common. A slip and fall incident can have a serious impact on your life, and we can assist you in claiming your legal rights to compensation. 1. Take photos of the matter that caused your fall. 2. Take photos of your injuries and of your clothing to show whether the clothes were wet or marked or dirtied from the fall. 3. Get names, addresses, and phone numbers of witnesses. 4. Contact the manager and report your incident. Get the manger's name, store number, and address. Make sure you read the written report for accuracy. Make sure you report all possible injuries. Even if a body part hurts just a little, report it. 5. Ask if there are surveillance cameras. If so, request the manager to not erase the film or data on the recording, and also do so in writing by certified mail. 6. Determine how much time your were in the store before you fell. 8. Contact us as soon as possible in order to protect your rights.